Practitioners of community-based participatory research (CPBR) warn that standard IRB review can reinforce the power inequalities that CPBR hopes to mitigate. 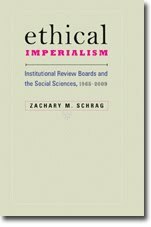 Adam Hedgecoe reports on two cases in which British university administrators turned to their university research ethics committees (URECs) not to protect the subjects of research, but to block controversial research they feared would tarnish the universities’ reputations. Two computer researchers describe a system at Microsoft Research designed to provide automatic approval for low-risk studies. Rather than follow the Common Rule’s exemption model of requiring IRB review if any of a series of conditions is met, the Microsoft system assigns numerical values to aspects of a proposal that bear some risk to participants. Proposals with a low total get immediate approval from an Excel spreadsheet.